Steven J. Ross speaks about his new book at the Orange Grove Bistro. Photo by Patricia Carrillo. 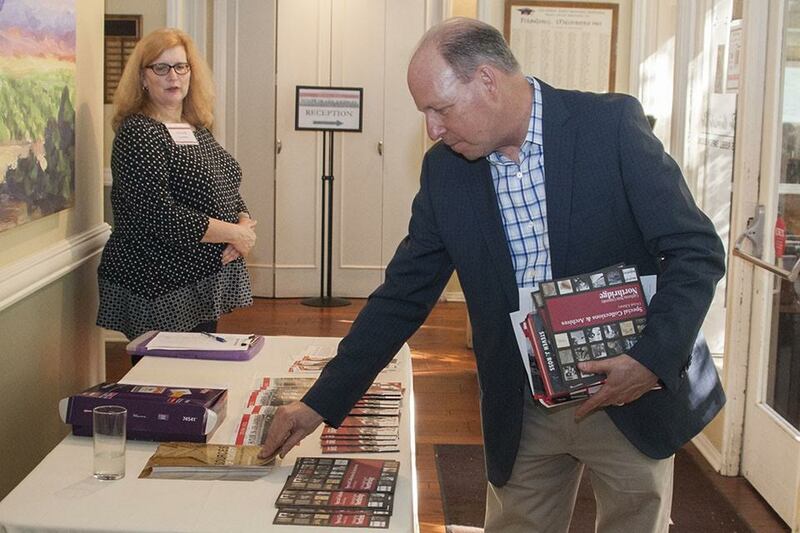 An attendee of Steven J. Ross' event picks up information. Photo by Patricia Carrillo. In the 1930s, Nazis held a series of meetings to formulate a plan to blow up the homes of more than 20 prominent Jewish figures and actors in Los Angeles, including Charlie Chaplin. A man named Leon Lewis stood up to stop it. 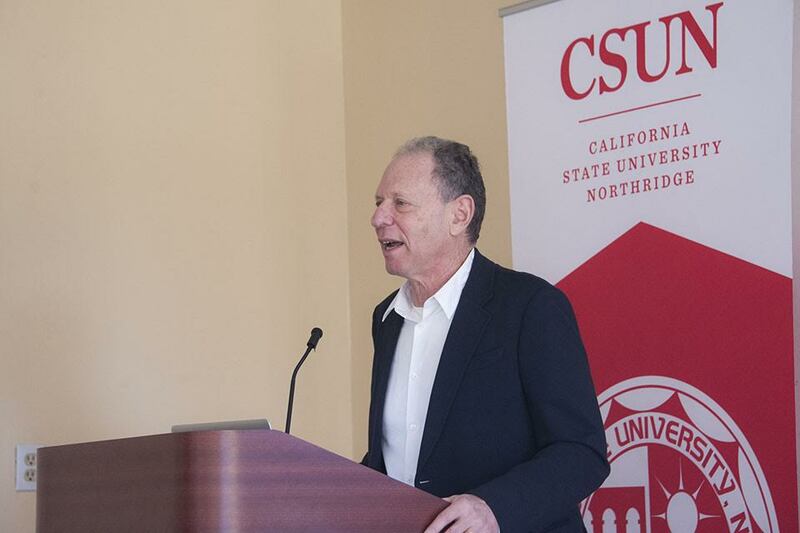 Lewis’ efforts to disrupt Nazi plans were captured by Steven J. Ross, professor of history at the University of Southern California, in his book Hitler in Los Angeles: How Jews Foiled Nazi Plots Against Hollywood and America. Ross’ book has been nominated for a Pulitzer Prize and made the Los Angeles Times bestseller list for five weeks. 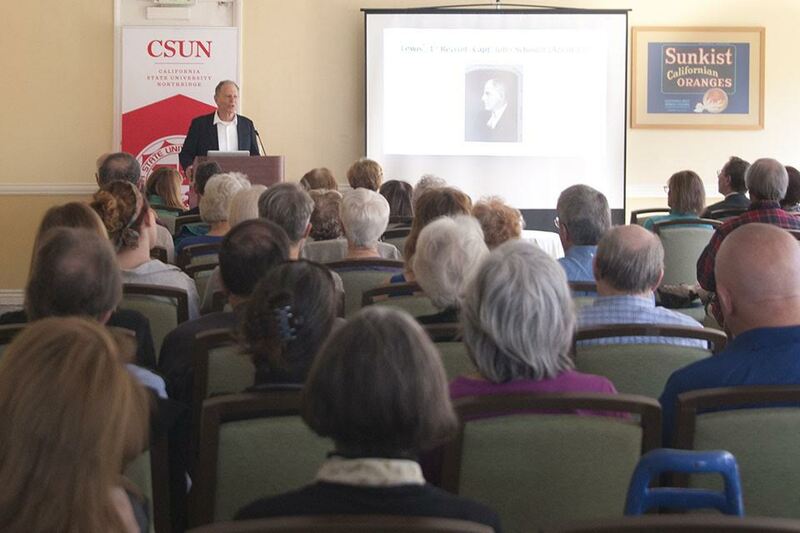 California State University, Northridge hosted Ross — who did much of his research for Hitler in Los Angeles at CSUN’s Delmar T. Oviatt Library — on Feb. 4 at the Orange Grove Bistro. The program was sponsored by the Oviatt Library. Ross told the chilling story of Adolf Hitler’s plan to take over Los Angeles and how Lewis, an attorney, stopped it. At the start of his presentation, Ross showed a map of LA dotted with numerous focal points of the Nazi and fascist homes throughout the area. Nazi influence was growing in LA, with their first-ever meeting on July 26, 1933. Lewis began to take notice of the increasing frequency of these meetings and, with this knowledge, took action. In the early stages of his book research, Ross dug deep into the Oviatt Library’s archives and brought the heroic details of Lewis’ story to life. The Oviatt Library holds the archives of the Jewish Federation Council of Greater Los Angeles’ Community Relations Committee. Its vast collection stretches from 1921-2000, with most of the documents not yet processed and cataloged. Hollywood is interested in bringing the story to the big screen or television, Ross said. At the end of the program, Ross emphasized the importance of standing up to hate speech. “When we see people spewing hate speech, we have to stand up and say something,” he said.